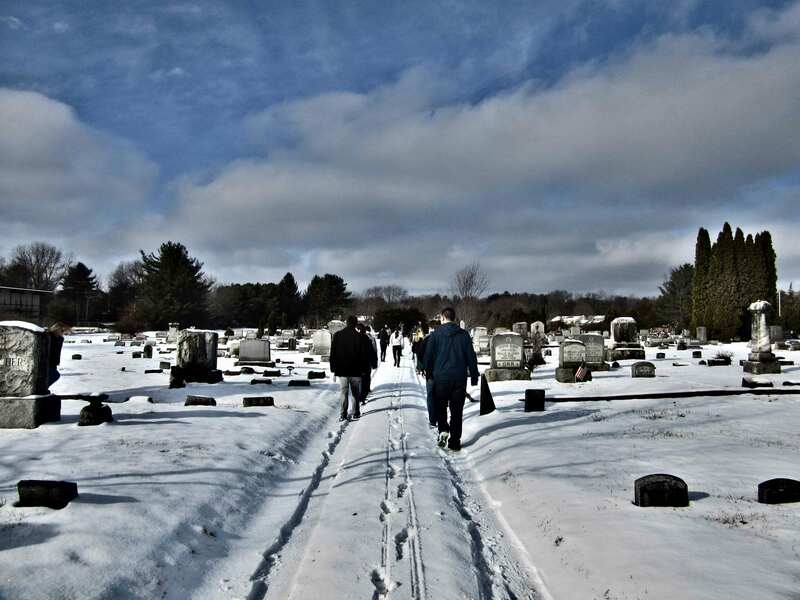 We walked in the snow, squinting against the early winter sun, moving past the headstones in one of the older cemeteries in our town. Small talk wound down as we approached our destination. We stopped, and greeted the reporter who met us there for the event. Austin opened the small bag of black river stones, and each student picked one to write a message onto. We approached the grave. Well, it is not really a grave, you see—a nineteen year old kid’s body lies somewhere back in Hawaii, at a place called Pearl Harbor. 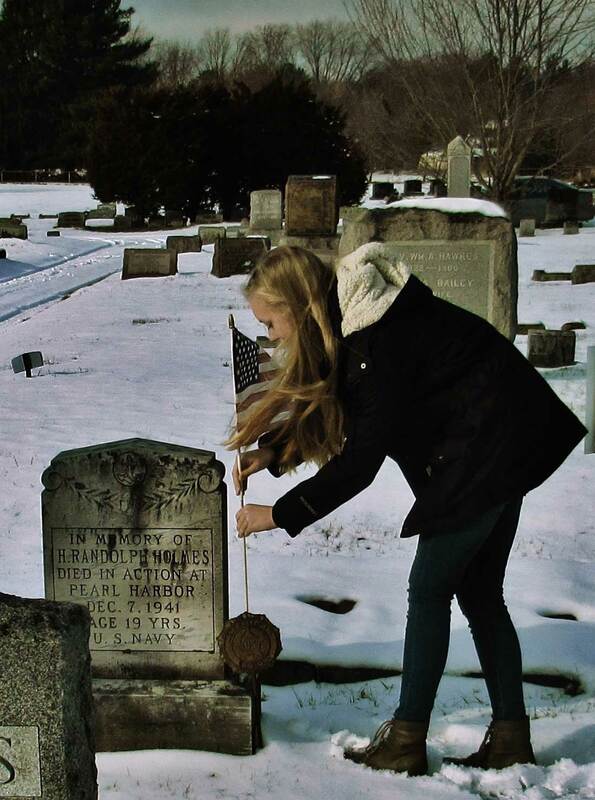 His parents lay just to the south of this marker, passing on 14 and 18 years later. The kid’s body was never properly identified. He lies in a mass grave somewhere else, far, far away. And here in his hometown, there is not even a flag on his marker. Why should there be? As far as I know, there is no immediate close family left here to tend to his stone, and he is not even here. But we buy a flag, and Paige affixes it to the holder. Paige holds the 1942 yearbook senior class dedication, and I pull out a copy of his photograph, and say a few words. Seventy-five years after his death, after his parents’ pain and anguish at the telegram announcing he was ‘missing in action’, after his classmates’ angst that following June at graduating without him into the new world of 1942, where so many of them would go on to fight and die along with him, a bunch of kids from his high school return. 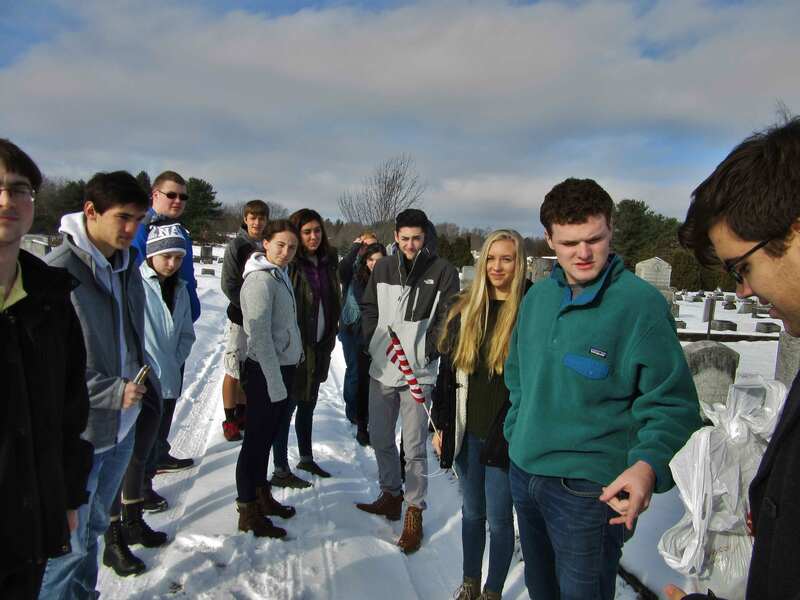 The 17 and 18 year olds are on the cusp of entering a new world themselves, along with them the 55 year old man who was once also a young graduate-to-be of Hudson Falls High School. 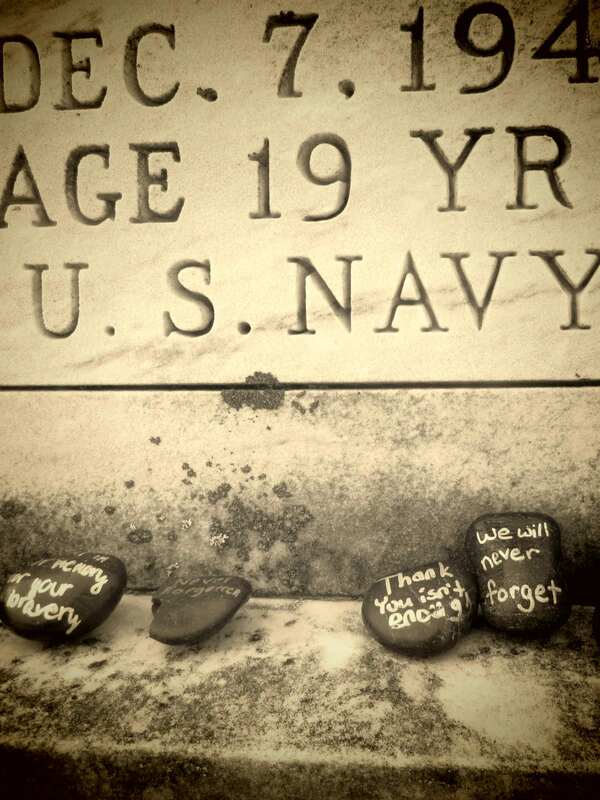 We come to remember, and to set down our memorial stones. The kids speak to the reporter, and we pose for one last picture. We are here for all of 15 minutes before the bus has to return to the school to make another run, due to parent-teacher conferences at the elementary level. It is quick, a surgical tactical strike in an overly crowded and rushed school day; some might say, hardly worth the effort. You wonder if the lesson will stay with them. 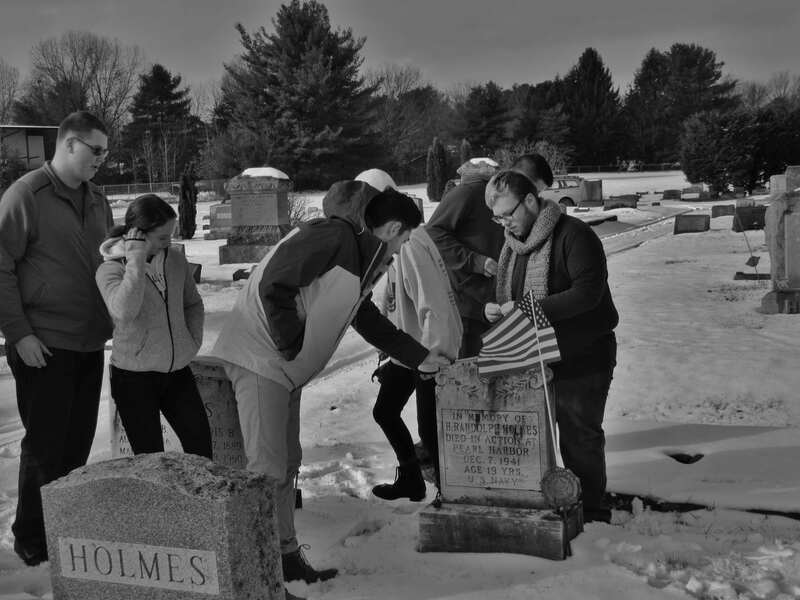 They leave this cemetery, some certainly forever, to go out into the world, having paid their respects to the boy from Hudson Falls whose future ended on December 7th, 1941. 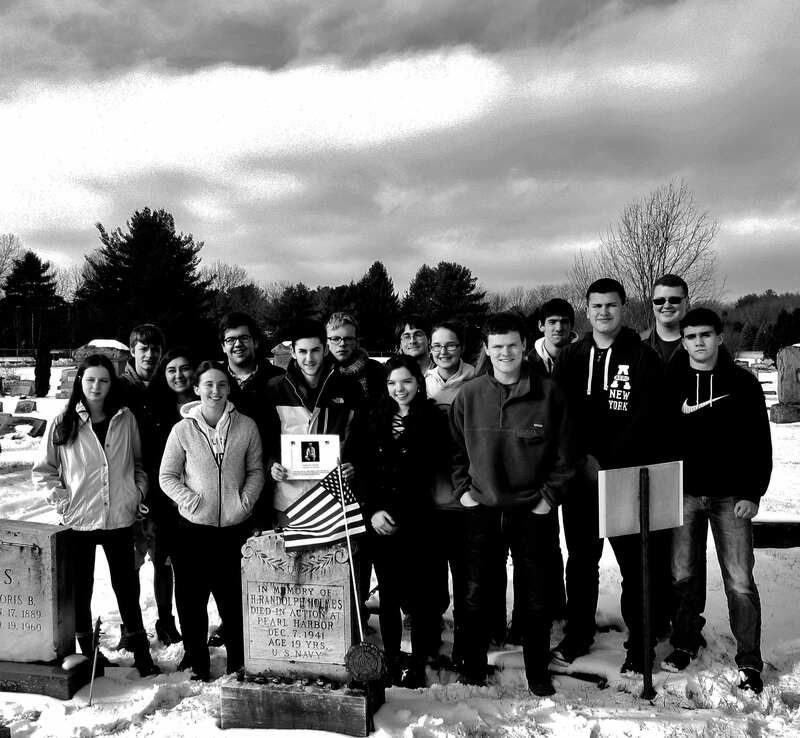 HUDSON FALLS — On a windy Tuesday morning, in a snow-covered cemetery, Matt Rozell’s history class took a somber turn. 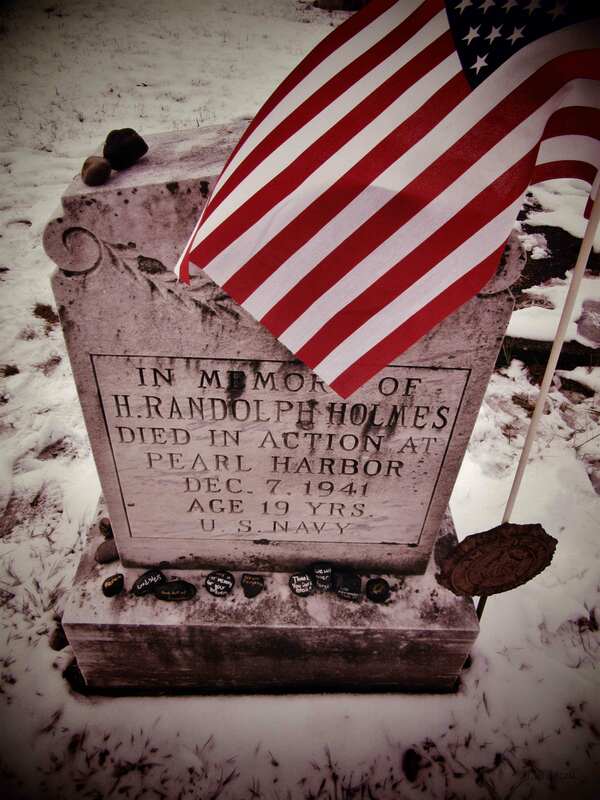 Holmes had been a student in Hudson Falls’ Class of 1942 but left school early, joined the Navy and was killed in the Japanese attack on Pearl Harbor on Dec. 7, 1941. 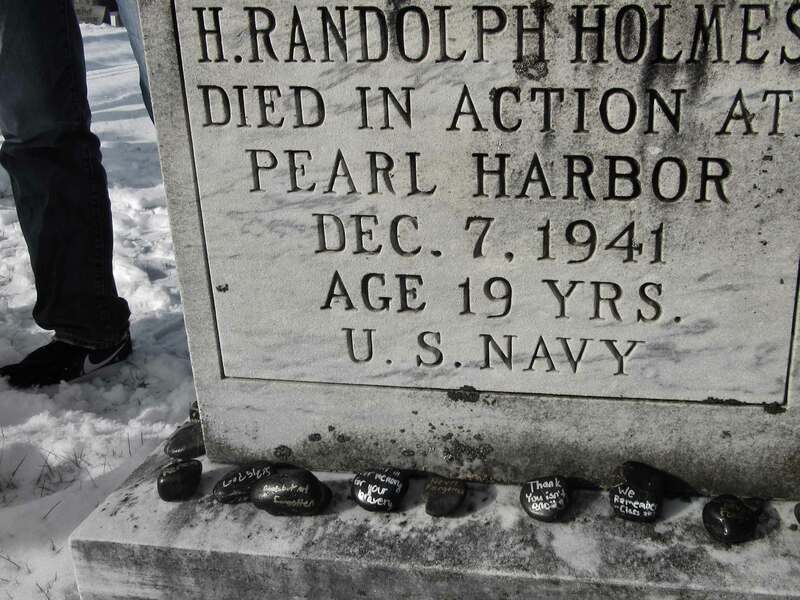 Several years ago, one of Rozell’s students located Holmes’ name on the memorial to those who died on the Oklahoma. 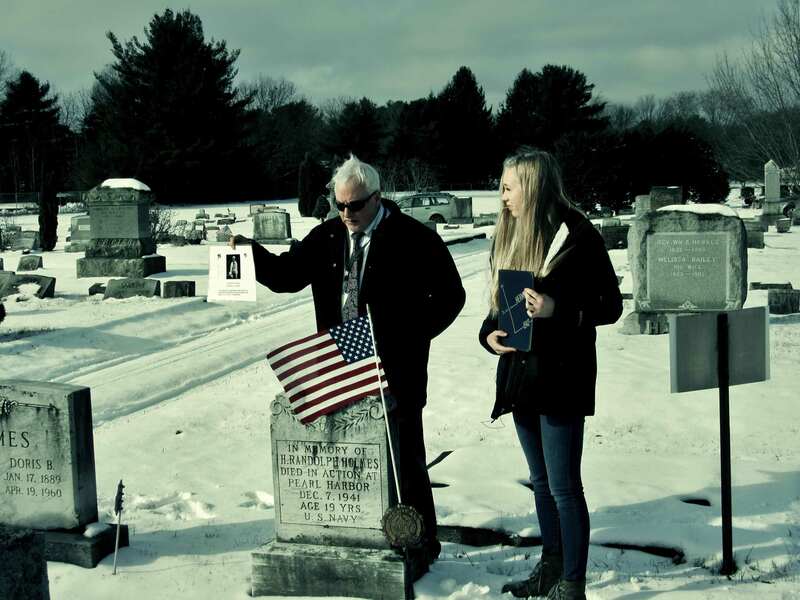 Two of Rozell’s students said Tuesday they had no idea a former Hudson Falls student had died at Pearl Harbor. Jacob Fabian said he learned about Holmes in class as well. 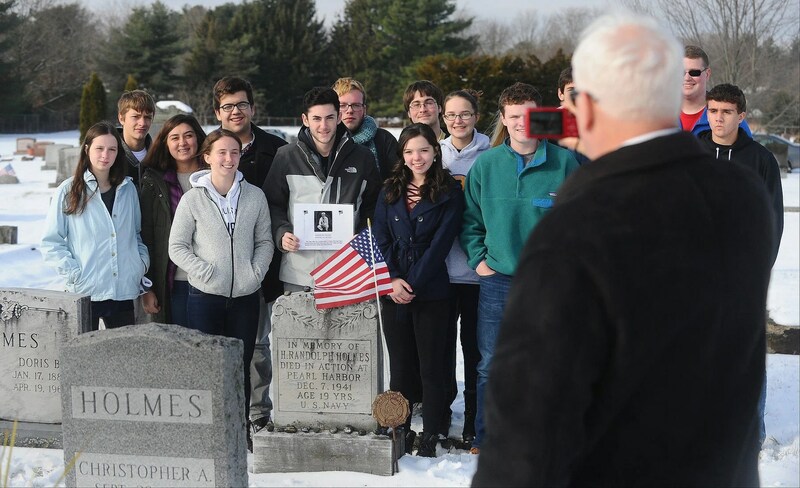 During the brief ceremony Tuesday morning, one of the students held up a picture of Holmes from the Class of 1942 yearbook and another held the yearbook itself as they stood by the memorial stone. Rozell had a student hand out black stones, and the students wrote on them and left them on the stone. Photo by Steve Jacobs, Post Star, Moss St Cemetery, Hudson Falls, NY, 12-6-2017. Holmes may yet come home. Five formerly “unknown” sailors from the USS Oklahoma were identified in January, using medical records. The identifications are the first to come from a project that began in April 2015 when the Defense Department announced plans to exhume an estimated 388 of the Oklahoma’s unknowns. The first exhumations took place June 8, 2015, and the last four caskets were dug up Nov. 9, 2015. Sixty-one caskets were retrieved from 45 graves. The caskets were heavily corroded and had to be forced open. The remains were removed and cleaned and photographed. The skeletons were flown to the lab in Nebraska for further analysis, but skulls were retained in Hawaii, where the Defense Department’s forensic dentists are based. Material from the Associated Press was included in this report. As of Nov. 30, 2016 the Pentagon says it has ID’d 21 of the 388 unknowns. A highly recommended PBS video is below. As of Nov. 30, the Pentagon says it has ID’d 21 of the 388 unknowns.